Frank and Lola shouldn't be the only ones that find love in Pensacola. Plan your romantic night away to Margaritaville Beach Hotel by simply following these four steps. 1.Book your room. Breathtaking Gulf of Mexico views with surreal sunrises and sunsets set the mood for a day of relaxation and romance. Order our DELUXE romance package where you can turn your room into a lovers getaway for just $99. The package includes a bottle of champagne, two silipint glasses, breakfast for two, and a delectable sweetheart dessert platter. Set up upon your arrival to ensure a worry free surprise. 2. Plan your itinerary. Romantic sunset sail or a mesmerizing massage in paradise sound nice? We encourage you to experience a couples massage with our licensed therapy specialists for blissful relaxation and overall improvement in physical health. Contact our Massage Therapist, David Ace at (727) 238-2818 or at davidacelmt@gmail.com. 3. Make a reservation for dinner. Don't forget about dinner plans! 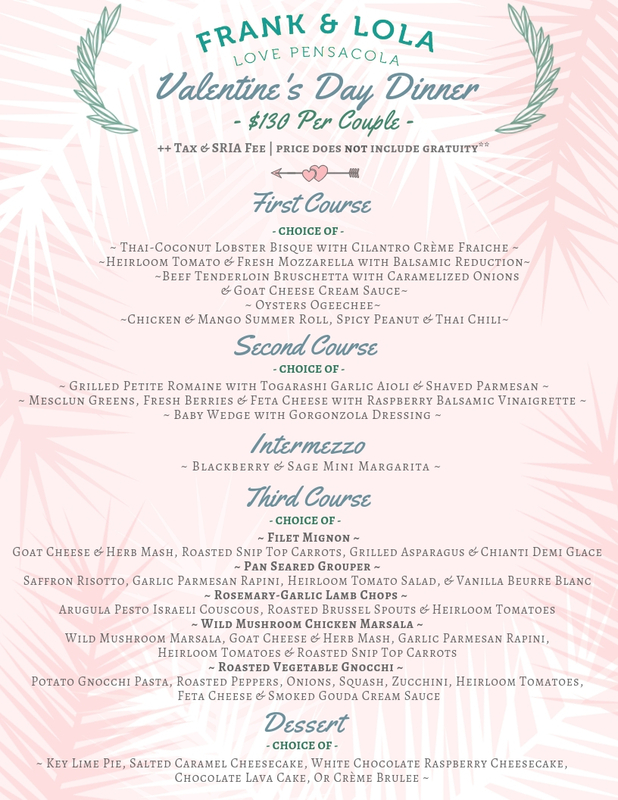 Be sure to have your reservations in place because Chef Eric's 5-Course Valentine's Day dinner is one of the busiest. This year, we've included an extra seating time for dinner so that we can accommodate more guests. Call to make a reservation (850) 934-8670. 4. Bring the love. The goal is to make the day special and enjoy each other's company, so make Margaritaville Beach Hotel your home away from home.